and Targets for the Work Force. Have you ever walked into a company and seen motivational posters in the office and manufacturing floor? With Dr. Deming point 10, he believed these are counter productive to achieving quality. Of all of the Dr Deming 14 points, this one is probably the most controversial. Managers believe posters, slogans, and targets motivate employees. In most cases these do not work. According to Dr. Deming, the posters slogananeering do not provide the means for employees to do better. While management invests time in posting and promoting these posters and slogans, employees feel the company would be better off if their efforts focused on true quality improvements. 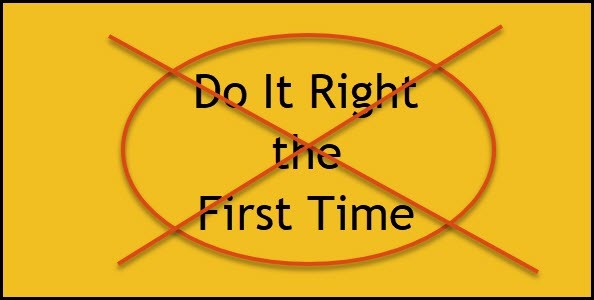 One of the most popular slogans, poster, and motivational phrase in business is "Do it Right the First Time". Sounds great. I've heard it used 1000 times. However when given deep thought about this, it is impossible to implement. The words "First Time" means doing something, making something, taking action, etc without never experiencing it before. The "First Time" we do something, we most likely will make a mistake. We do not have experience with the process and mistakes will occur. Looking back at the poster "Do it Right the First Time", it doesn't help us. It doesn't teach us anything. If I make a mistake, (due to my lack of experience) when I'm doing something the first time, the poster becomes anti-motivational. How can I meet the intentions of that poster? This Dr. Deming point is controversial. To meet ISO 9001 requirements your company needs to have a Quality Policy. This Quality Policy must be communicated throughout the company. Auditors will ask employees about the details of the Quality Policy. Does your company Quality Policy provide the methods to obtaining product Quality? Most likely not. Dr. Deming would probably disagree with this ISO requirement. If you follow Dr. Deming Point 10, then you would eliminate motivational posters because slogans without the actual methods are worthless. Inspiration without a roadmap is not helpful. I have actually seen slogans work and improve Quality. Let me give you an example. I worked with a company that made small ceramic parts in the millions. Ceramic has a tendency to chip when they are mishandled. To counter this, we created a slogan "The broken parts have spoken, we beg, please treat us like eggs." We rolled this out to all the floor PCs and posted posters. We immediately saw a reduction in the amount of broken parts. This continued and we were able to put preventive measures in place to further eliminate the issue. The difference with our slogan and standard motivational posters is that our slogan had a described method with it. The slogan addressed a specific issue and provided an action for employees to follow. Dr Deming point 10 also advices not to use production targets as a motivational force. I will delve deeper into this in Dr. Deming Point Eleven, "Eliminate Numerical Quotas".